Having one child with cancer is heartbreaking and scary, but having both your children diagnosed with the same rare form of cancer? Unimaginable. And yet, that’s the reality for parents Duncan and Nohea Avery. Just two weeks after their 6-year-old daughter Kalea was diagnosed with an aggressive form of brain cancer, their 4-year-old son Noah was given an identical diagnosis. It all started over Memorial Day weekend when Kalea got very sick. At first, her parents thought she had the stomach bug, but after days of throwing up, intense headaches and long naps, they took her to the hospital. They called Kalea’s pediatrician and took her to a neurologist, who accredited her issues to muscle tension. But after a week went by, Kalea only had gotten worse. On June 8, her mother took her to the emergency room after she had been lying in a dark room, crying incessantly because of the pain. The doctors in Torrance, California, finally discovered that a giant mass on Kalea’s brain was to blame for her excruciating pain. Last month, the Averys were still attending to Kalea, who was recovering from surgery to remove a medulloblastoma, when they discovered that 4-year-old Noah had one, too. The cancerous tumor is extremely rare, only affecting between 250 and 500 children in the United States a year, which made the news of Noah’s diagnosis so unexpected. The survival rates for medulloblastoma are based on a patient’s age and how far along the tumor has progressed, according to St. Jude’s Research Hospital. If the tumor has already grown and spread to the spinal chord, survival rates are at 60 percent, but if it has not spread, they can be upwards of 70 or 80 percent. For parents who have ever wondered how you would talk to such a young child about this, Duncan Avery explains how he and his wife chose to do it. He said that they told Kalea that she had a boo-boo in the back of her head and that the doctors needed to operate in order to take it out and make her better. “She was in good spirits,” Duncan said. Since her surgery, Kalea has been in recovery, slowly getting back to her old self. But just when the Averys were starting to feel some relief, Noah, started to exhibit weird symptoms. He was acting sad and depressed, something that was not normal for the 4-year-old. At the same times, he began complaining of headaches between his eyes, which was where Kalea had complained about them as well. At first, the Averys chalked the behavior up to Noah missing his sister, who had been in the hospital since her diagnosis. But when a relative noticed he was walking funny, they knew it was time to bring him to the hospital. “He was just leaning and tilting to the right, and then his headaches started the next day,” Duncan said. At the hospital, doctors eventually confirmed the Averys’ worst fear. “My heart literally felt like it was broke apart, and it was being pulled out of my chest,” Nohea said. After one round of fighting the aggressive brain cancer with Kalea, the Duncan and Nohea knew they’d be forced to do it again with their youngest child. “You take one look at your baby’s face, then you get back up again,” Nohea said. It is so rare for one child to be diagnosed with medulloblastoma, but having two children in the same family is unheard of. “I’ve never seen it. I don’t know anyone else who has seen it,” Ramin Javahery, the medical director of pediatric neurosurgery at Miller Children’s & Women’s Hospital and the kids’ surgeon, told The Washington Post. Due to the rare nature of cancer, the family is going to seek genetic testing to see if there are any answers in their DNA for why their two children were struck with the same condition. “We’re assuming it’s some unbelievably rare occurrence based on genes that both were carrying,” the doctor said. Both Kalea and Noah have had their tumors removed and are now seeking further treatment as well as recovery therapy. “My daughter is currently going under physical therapy, occupational therapy, speech therapy,” said Nohea. 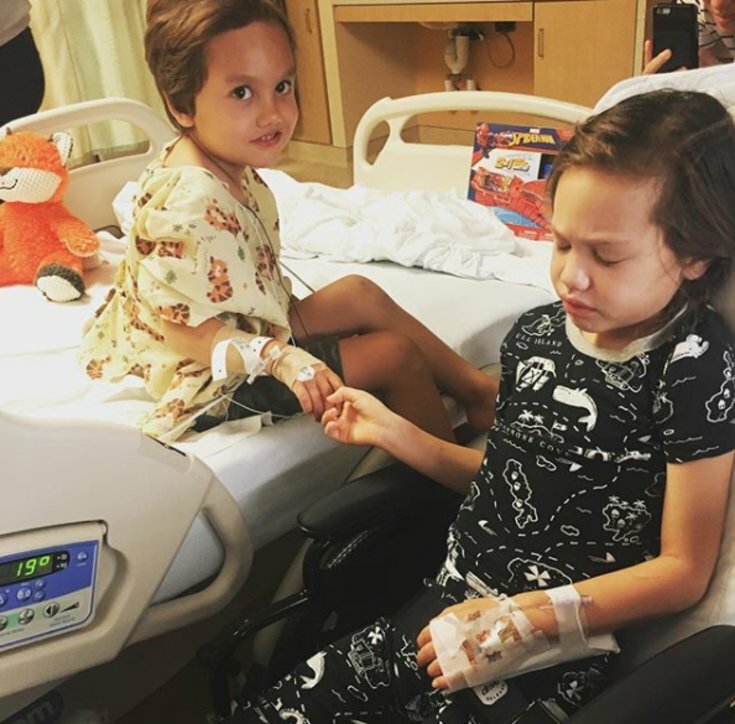 The Averys have set up an Instagram account called “Fight Like the Averys” where they share updates on their children’s progress. The medical cost for Kalea and Noah’s treatment is currently up to $160,000 — an unfathomable amount for most families. A friend of the family set up a GoFundMe page to help with the costs. To learn more and to donate, click here.